Joya de Nicaragua Cabinetta Serie is a crowd favorite around the globe. Its unconventional two toned wrappers or Doble Capa, makes it very attractive to the eye. However, its creamy smoke with peppery notes and mild to medium strength is what keeps captivating consumers. Very unique, indeed. You may think the Spanish word “joya” means “joy” in English but actually it translates as “jewel”. The cigar makers at Joya de Nicaragua have created a unique smoke that every cigar enthusiast will truly enjoy. 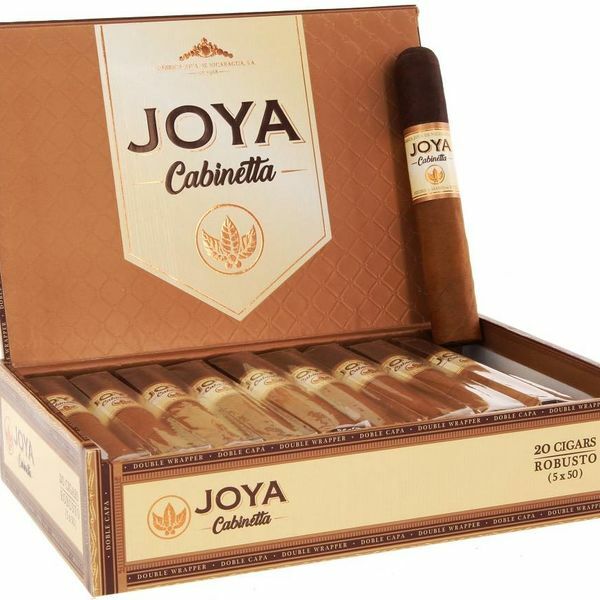 Joya de Nicaragua Cabinetta Robusto has a unique two toned wrapper known as a Doble Capa. The Nicaraguan binder and filler are encased by an Ecuadorian Connecticut Shade wrapper and finished with a sun grown Nicaraguan Habana Criollo wrapper at the tip, creating a beautiful looking Doble Capa. Joya de Nicaragua Cabinetta Robusto is a jewel in the cigar world and truly a joy to experience! The mild to medium-bodied Cabinetta Robusto emits a creamy, smooth smoke. The senses are met with notes of cocoa, almond, peppery spice and earth. Smoke one of these at your local cigar bar and you’ll be the talk of the town. Truly, a one-of -kind cigar, Joya de Nicaragua Cabinetta Robusto makes a creative gift around the holidays. Pair this with a bottle of Nicaraguan rum such as Flor de Cana 25, a handwritten drink recipe and your friends and family will be transported to the Emerald Coast of Nicaragua. The Macuá is the national drink of Nicaragua named after pajaro macuá, a tropical bird native to the country. Fill a cocktail shaker half way with ice and add rum, guava juice, lemon juice, orange juice, and simple syrup. Shake for 25 seconds. Serve in a Collins glass filled with ice. Garnish the glass with an orange slice.